David Bergman of the Centre for Corporate Accountability unravels the complexities of the corporate manslaughter charge. Corporate manslaughter is a crime that can be committed by a company in relation to a work-related death. The offence is intrinsically linked to whether a director or senior manager - a "controlling mind and will" of the company - is guilty of manslaughter. If the director or manager is found guilty, the company is guilty; if the director or manager is found innocent, the company is innocent. Is it difficult to prosecute? Proving corporate manslaughter has been notoriously difficult in the past. This is because the law requires that a director or senior manager is prosecuted before the company - a separate legal entity - can be prosecuted. The law does not impose any positive duty upon company directors to take action to ensure that their company complies with health and safety law. Have any large companies been prosecuted? Four large companies have been prosecuted for manslaughter - and all the cases failed. The trial collapsed in its early stages when the judge ruled there was insufficient evidence against any director or senior manager. 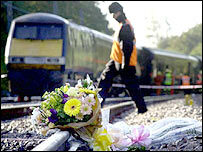 Great Western Trains was cleared of the manslaughter of seven people who died in the Southall Train Crash in 1997. The Crown Prosecution Service tried to prosecute the company without prosecuting any individual director or manager. The court ruled the case could not go ahead on this basis. The company subsequently pleaded guilty to health and safety offences and was fined £1.5m. In Network Rail and Balfour Beatty's case, the companies were cleared before the case came before the jury. The judge decided there was insufficient evidence to proceed. Have there been any successful prosecutions? There have only been six successful prosecutions and these have all been against small companies. Only 10 company directors have been successfully prosecuted and only four proprietors. The sentences open to the courts are unlimited fines and jail sentences. In practice, most sentences are suspended and the fines have been comparatively small. Three years has been the maximum period of imprisonment, and £25,000 the greatest fine. Are there plans to reform the law? In June the Home Office published a draft bill proposing a new offence of "corporate manslaughter". This would allow most employing organisations to be prosecuted for causing a death as a result of a very serious failure on the part of a senior manager. That would include crown bodies like government departments but not unincorporated bodies like clubs or schools. When will the new offence be introduced? The consultation on the draft bill was completed in August. It will be subjected to independent parliamentary scrutiny before a joint Home Office and Department of Work and Pensions select committee - due to hear evidence in October. After the government has considered the consultation and committee responses, it will make any amendments and present it to parliament. The legislation was mentioned in the Queen's Speech, so is due during this session of parliament.